If you ever find yourself in Burton, Texas -- population 359 -- you may hear some strange sounds coming from a particularly remote barn. 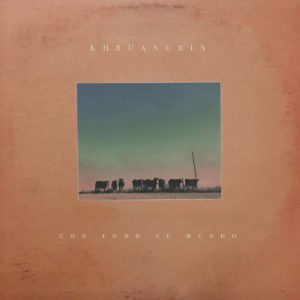 The sounds are those of Khruangbin, a psychedelic trio who draw inspiration from the deepest depths of music history: mixing 1960's funk scene in Thailand, 1970's Persian rock music, and 1980's Algerian symphonia with a dash of disco, soul, and balearic music. Though the band's inspiration comes from all around the world, their roots are distinctly Texan. Ever since their first rehearsals, Khruangbin have recorded at their remote Burton barn, their spiritual home. Which means their stage performance was honed not playing to hipsters in venues, but to cows out to pasture. After developing a fan base of the barnyard variety, they decided to find out if humans would enjoy their music too. Since then, they've found their audiences just as diverse as the music itself -- selling out headline shows in the US, UK and Europe, supporting acts like Father John Misty and Massive Attack, and late last year, signing on to be Corona's official brand sound. They've found fans all over the world, from Iggy Pop to Haley Joel Osment to Lee Hyori, Korea's biggest pop star, and play festivals as diverse as Glastonbury to Electric Forest to the upcoming Wonderfruit in Thailand. To showcase their many influences, the band does a weekly DJ set every Friday morning at 9am PST called AIR KHRUANG. Each episode showcases the best old school funk from a different city. Recent "flights" include destinations such as Addis Ababa, Tehran and Istanbul. They can also be found on their NTS radio show, Cabin Pressure, where they pay homage to the funketeers around the world who've come before them. Their debut album, ‘The Universe Smiles Upon You,’ was released in November 2015 to widespread acclaim. Anticipation is high for new album ‘Con Todo El Mundo’ which will be released in January 2018 by Night Time Stories and by Dead Oceans in the US.